Sherrie Scraps with passion: Happy Thanksgiving! Very sweet card! I love the gorgeous colors you used for your project! The little bear is so sweet and the touch of ribbon with a sparkly gem is the perfect finishing touch! This is just so sweet! What a cute little bear. I hope you have a blessed and wonderful Thanksgiving! Oh my gosh, how sweet is this??!! That is the most adorable bear, Sherrie!! I love your doodling and the gorgeous ribbon!! The distressing is fabulous!! Beautiful card my friend!! Thank you for playing along at My Craft Spot!! 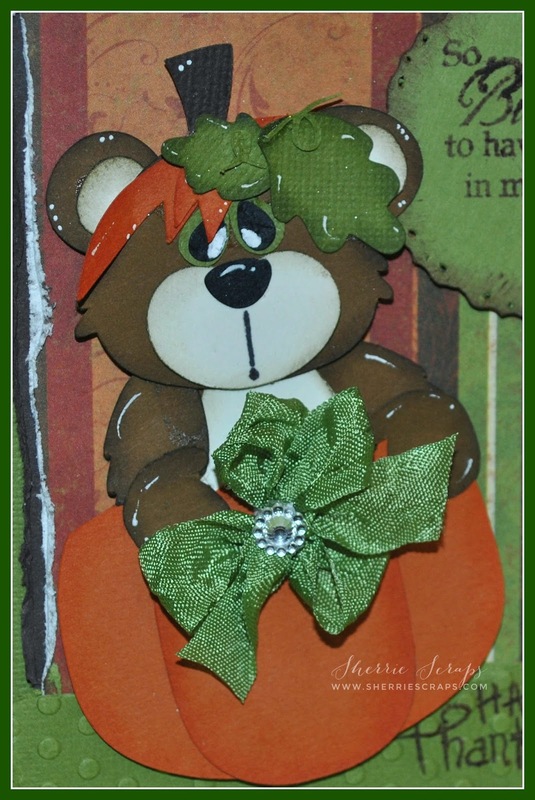 The distress tool is Super fun!Adorable pumpkin bear and I LOVE the bow..especially the green!! Adorable card my friend! And there's that fabulous bow! Gorgeous! Take care and safe travel home! Soooooooo cute cute cute! LOVING that bear in the pumpkin!!!!!!!!!!!! Sherrie, your card is adorable! What a darling cut file, made even lovelier by the extra special Sherrie touches! :o) The doodling and inking are beautiful and I love your happy bow. :o) The sparkly center is stunning! The sentiments are gorgeous and will be such a blessing to the recipient. Beautifully done, my dear friend! Thank you for playing along with us at My Craft Spot! Also, I wish you and your family a beautiful Thanksgiving! May it be filled with heavenly love and light. :o) Extra holiday hugs for you, my sweet friend! Awww, this card is just too cute. I love the image, the embossing and the inking. Hope you had a great holiday and thanks for joining us at BBTB2. Very cute card! I hope you had a lovely shopping trip :) thanks for joining us at FCCB this week! What a super adorable card!!! Love that cute pumpkin bear!!! Have a great day. so super cute, love the distressing! I hope you and your sister found some good deals. A number of retailers are getting into Black Friday here too. Even though I didn't get the day off, I did do a bit of shopping in the evening. I love a good deal! Your card is ADORABLE!! Your little bear is so sweet and I love the look of the tattered paper edges. Fabulous creation!! Sherrie ~ oh this is just too ADORABLE!! LOVE the file and oh my the papers and how you distressed the edges!! LOVE the little doodling and oh my your PERFECT bow with the little center thing!! FABULOUS creation! Hope you and your family had a wonderful Thanksgiving! Too cute. I can't stop smiling. Love it my friend.